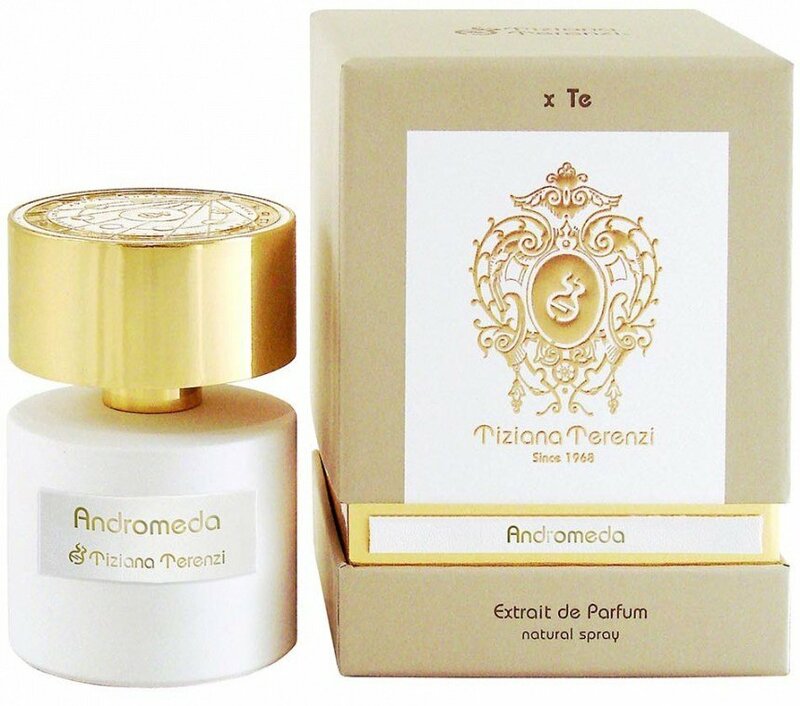 Andromeda is a perfume by Tiziana Terenzi for women and men and was released in 2015. The scent is floral-fruity. The longevity is above-average. It is being marketed by Cereria Terenzi Evelino. It's a cross with us, with Ambroxan and me. A big, dark, heavy cross. As big and dark as the love that met me like a sledgehammer in Sentifique's "Testostérone". Who made me sniff and languish for this black, heavy cloth, so powerfully male spicy, the indecent thought chased through areas north and south. I then met him again and again on my own skin and that of a stranger, again and again, more and more often - and out of power became superiority, out of urge distress, the dense darkness increasingly took my breath away and made love flee far and wide. Because it seems omnipotent, this ambroxan, imperious and possessive, no longer wanting to leave skin and even more hair - olfactory stalking comes to my mind, which is an exaggeration, of course, but that's just how it is sometimes when love goes. A fragrance that contains Ambroxan only conveys this to me and my nose: Ambroxan. "Thou shalt have no other notes beside me!" They may be flowers and fruits, woods or resins, consecrated or tarred smoke - they have no chance to unfold on me, to reach my nose and my brain. At the very beginning perhaps still, moments only - then there is some bitter green, a breath of fine floweriness, a little aldehyde, whatever is listed. Two breaths, maybe three - already the dark force rolls up, a tsunami, a hurricane, covers everything, everything until nothing remains more than dark spice smoke hot. It's the same with me, again and again, it's the same with "Andromeda". The pyramid shows me such wonderful notes, such delicate flowers, such juicy-sweet fruit. I can read them, if I loved them, I would certainly love them if we had the slightest chance of a rendezvous. At the very beginning there is a hint of green, of stem green, rasp green, bitter green - but only very far away from me, at least an arm's length away. This may be the man who shares life and limb with me - "it smells like gardening, quite hard, and like skin that needs a shower". But when he gets closer and still much closer, then he smells only "stinging dark poison - go wash it off, it's not healthy!". All this, I know it well, is due to me, to my skin - to the love that Ambroxan probably has for me, which I, on the other hand, cannot reciprocate, no longer. It's too much, too big, too deep, takes too much possession, won't let go of me. She clings firmly to her skin and hair, for days, many showers, in the heat even more than in the snow. That almost hurts a bit. Write the first Review for Andromeda!